The Duet is the more compact version of the Quartet. Just like the Quartet it has 2 61 note organ keyboards, Percussion Controls and Vibrato / Chorus Controls all in the right locations. Even the drawbars feel like those found on a vintage drawbar organ. Also, both the Duet and Quartet organs are built solidly with an emphasis given to the aspects of ergonomics. The sides of the organ are Solid Wood. No veneer or vinyl over MDF. Using solid wood makes it light and strong. Also, there are no exposed screws making for a clean look on the sides. Top Row. 4 buttons for Selecting the reverb type, setting the position of the keyboard split and turning Split ON, and pedals to lower keyboard. Bottom Row. 4 presets for the upper and lower/pedal drawbars. Rotary Controls. 4 for adjusting Volume, Overdrive, Tone and Reverb. Due to demand all orders take two to three weeks to complete. The optional Programmer Unit allows to adjust the advanced features of the HX3. This is handy if you want to change the parameters on the fly. 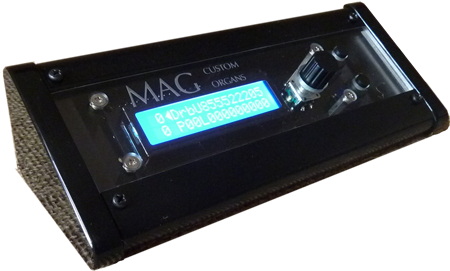 MAG Custom Organs and it's logo are trademarks of MAG Organs of the Czech Republic. HX3, KeyboardPartner and it's logo are trademarks of KeyboardPartner of Germany. Ventilator, Neo Ventilator,r Ventilator II and it's logo are trademarks of Neo Instruments of Germany. Further Diversi Musical Products is not affiliated with Neo Instruments and is not a service provider for their products other than what is installed in the MAG / Diversi Organs. Diversi, Diversi Organ and it's logos are trade marks of Diversi Musical Products, Inc. of the United States. Diversi and MAG Customer Organs reserves the right to change specifications, product descriptions, product features, pricing and models, discontinue models at any time without prior written or oral notice and without liability. Color Disclaimer. Due to variations in individual user's monitor settings, calibrations, and lighting sources, we cannot guarantee exact colors represented on this site. What makes the Quartet different from other clones? It's in the details! Emphasis is placed on the every aspect of this organ. 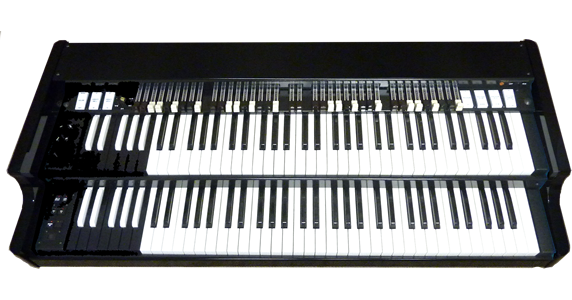 From not only the sound but ergonomics, the look and feel of the Drawbars, as well as the Percussion and Vibrato/Chorus tabs, the Rotary Control for Vibrato/Chorus and even the height of the drawbar shelf above the upper keyboard. The sides of the organ are Soild Wood. No veneer or vinyl over MDF. Using solid wood makes it light and strong. Also, there are no exposed screws making for a clean look on the sides. It's everything you expect from a organ that is full sized with 4 sets of drawbars and reverse color preset keys. Located to the left of the upper keyboard presets are four rotary controls for Volume, Overdrive, Tone, Pedal Sustain and Reverb intensity, all without menus. On the left of the lower keyboard are button controls for selecting the reverb type, setting and turning on keyboard split, pedals assignment and by-passing the programming of the Mini Vent II, which is included. Also supply phantom power 5vdc (requires true 5 Pin DIN.